Home › Apparel › What are the Best Golf Pants? Although you may not be playing for million dollar contracts in the NFL, Mr. Deion Sanders does have a point. When you feel confident and comfortable about the way you look, you tend to perform better. Just think about how you feel after a fresh haircut, or when you put on your best suit. The game of golf is no different. And, a nice pair of golf pants can do more than just show off your assets. The best golf pants will not only look good, but also be comfortable, breathable, flexible, and allow you to focus on your game. In fact, the extra boost of confidence could even help you shave a few strokes off your game! Though you may not buy into all of this “look good, play good” mantra, the fact is that even if you had a terrible round, at least you looked great doing it! Here are a few of the best golf pants on the market based on a combination style, price, comfort and customer feedback. Adidas’ Clima-Lite pants are some of the finest golf pants around. They are flat-front style (not pleated) and made of 100% polyester. 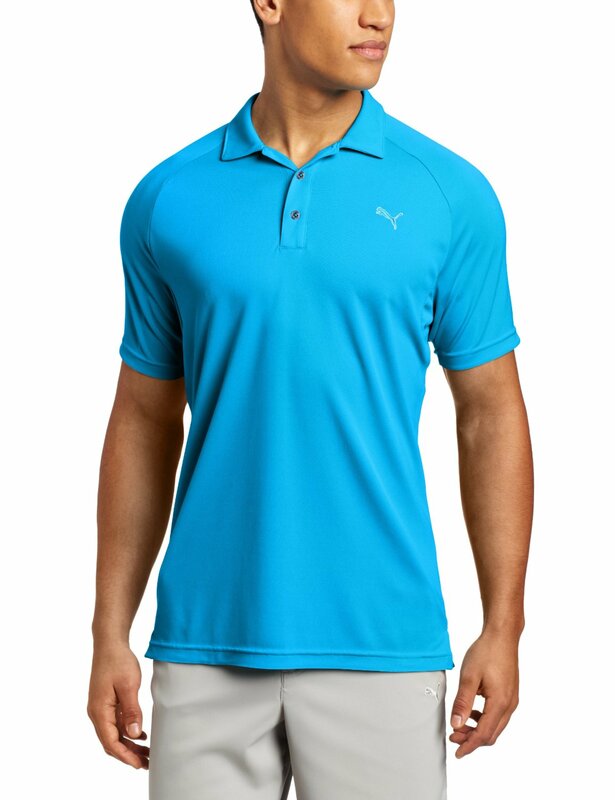 The material is comfortable, lightweight and very breathable. You can use them in middle of summer and not feel hot. The pants also stretch with your movement, so it will not restrict your swing in any way. One downside for some people is that these are “slim-fit” style pants, so they may tend to feel a bit tighter especially around the upper thighs. This is especially true for people with thicker legs. You can always try to order a size or two higher than normal to mitigate this problem. 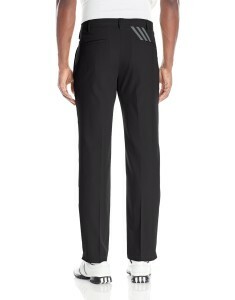 Overall, the Adidas Clima-Lite pants look great and can be worn on or off the course with no problem. They are available in a huge variety of colors, and all standard sizes. Pick your own today! Buy the Adidas Clima-Lite 3-Stripes Pants here! Want that classic look, but with all the modern tech? Then these awesome golf pants from Nike Golf could be for you. The Nike Golf Men’s Flat Front Tech pants are constructed with Nike’s patented Dri-FIT fabric that will help you stay dry, cool, and comfortable throught your round. The fabric also flexes with you as you move around and sit making them much more comfortable then normal khakis or dress pants. The classic look of these pants means that they can also easily be worn to the office, restaurant or even church without people noticing that they are golf pants! Check out color options and sizes at the link below. Buy the Nike Golf Men’s Flat Front Pants here! Under Armour has recently been venturing more into golf, and is the official sponsor of current world #1 ranked golfer Jordan Spieth. They make great golf apparel, and the Match Play Pants are a great example. They fit true to size and are some of the most comfortable pants you will ever wear. They use a super lightweight material that stretches as you move for optimal mobility. The waistband also stretches for extra comfort — especially great when you eat a big meal after a round. Similar to the Nike pants above, the material also helps wick sweat away and dries fast to keep you cool and comfortable on hot summer days. The UA Match Play pants are a straight-leg, flat front design, and available in multiple colors. They look great whether you wear them on or off the course. They are a tad bit more expensive than others, but are easily some of the best golf pants available. If you want quality, then definitely check these pants out! 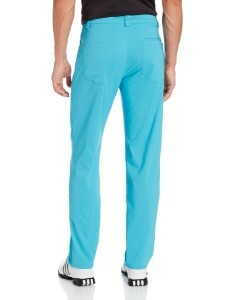 Buy the UA Men’s Match Play Pants here! Want something with some more style and flash? Then the Tech 6 Pocket Pants from Puma Golf are for you. These pants are available in a variety of bright colors and will definitely set you apart from regular boring pants (think Ricky Fowler style). They are slim fit style, but are comfortable and stretch as you move thanks to the slightly spandex type material. The material is also extremely lightweight and moisture-wicking to keep you cool. One unique feature about the material is that it is UPF 50+, giving you protection from the sun’s harmful UV rays. Another unique featue about these pants is the number of pockets. There are six pockets, as opposed to the normal four. This is perfect if you like to carry around everything on you like scorecards, tees, divot tool, etc. If you want to stand out from the crowd, then then Puma Tech 6 Pocket Pants are definitely the best golf pants for you! 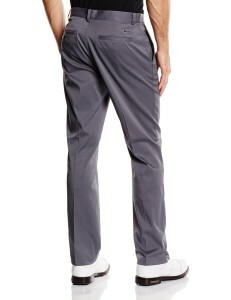 Buy the Puma Golf Tech 6 Pocket Pant here! Just want a solid pair of golf pants at a good price? Then the IZOD Microsanded Golf Pant is a great choice. You won’t be turning heads or walking down the runway with these, but they have everything you need in a pair of golf pants. They are durable and lightweight. The polyester fabric stretches as move, so it will not obstruct your swing. The fabric also helps disperse sweat to keep you cool and comfortable. They fit normally, but the legs are bit wider and baggier than normal. It might look a bit strange if you have skinnier legs. 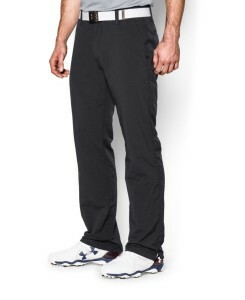 Overall though, these are great golf pants, and for a sale price of just $30 (MRSP $60), you won’t find a better deal! 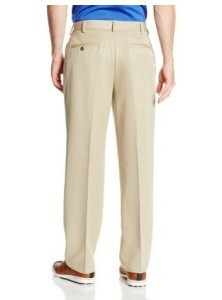 Buy the IZOD Men’s Classic Fit Microsanded Golf Pant here! A good pair of golf pants will not only help you look great but also give your confidence a boost which will (hopefully) improve your golf game. Choose from our list of the best golf pants to get started! ‹ What are the Best Irons for Beginners?